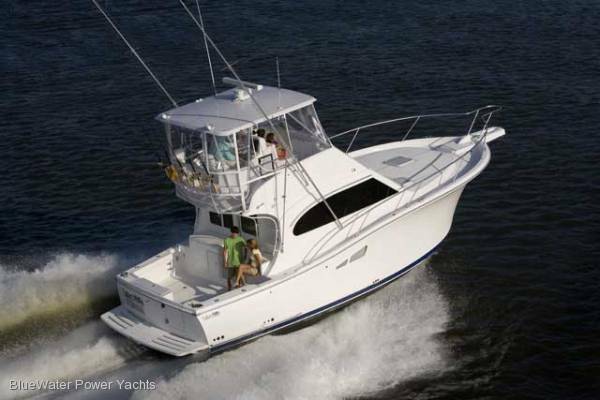 Luhrs latest flybridge model, the 35 Convertible is a handsome boat from any angle. At 11.80m (38’10”) LOA and 4.4m (14’6”) Beam she’s a big, powerful boat. Take her for a run and you soon appreciate that the timeless sleek profile, Carolina bow flare, wide beam and deep v under-body are for more than great looks. 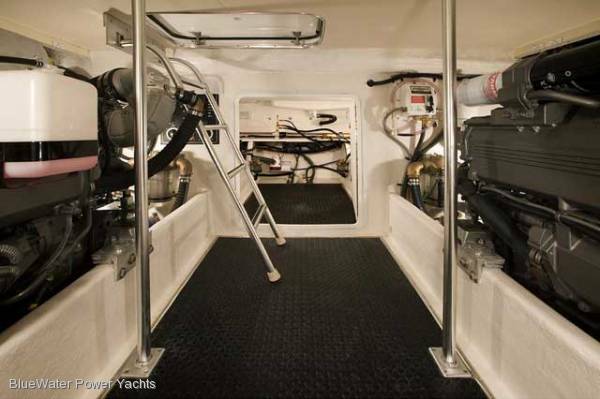 Like all Luhrs, the ride is comfortable and dry with seaworthiness second to none. 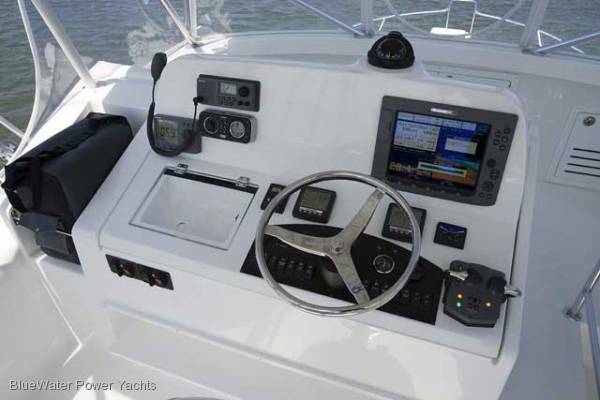 The large cockpit is well equipped with underdeck courtesy lights, fresh & raw water taps, bait prep centre with tackle drawers, live bait tank, icebox, sink, 2x built-in large fish/storage boxes, underdeck oversize mooring cleats, and a transom door. All standard. Instead of a ladder, flybridge access is via the comfortable and safe BridgeWalk™ steps. 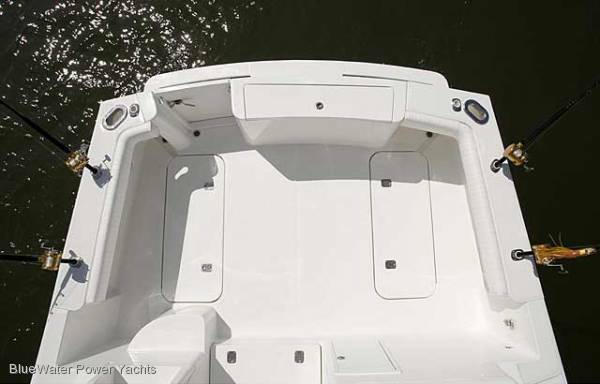 Up on the bridge, protected by the hardtop, there is a bench seat for guests ahead of the control console and a built in seat in each aft corner. The helm chair is positioned for communication and visibility while the stainless wheel and electronic engine controls make handling this baby a dream. There is plenty of room on the console for big-screen electronics. The new 35 Convertible is about more than the great outdoors though. 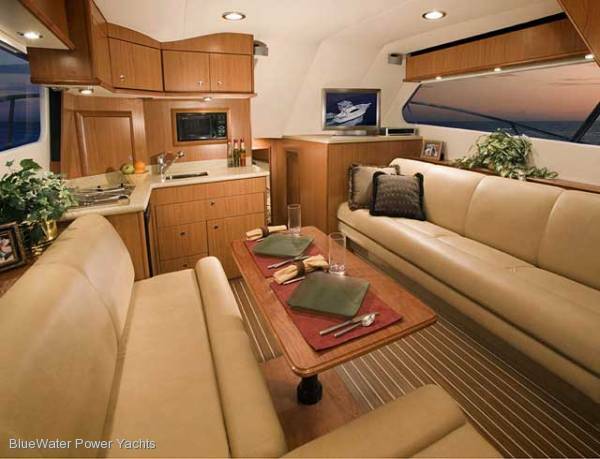 There are 2x comfortable lounges and large galley in the main salon. The wide beam ensures plenty of space for living and enjoying. The standard Entertainment package includes a 26” Flat Screen TV and Bose sound system. The head has a electric toilet (with holding tank & macerator) plus a separate shower stall. 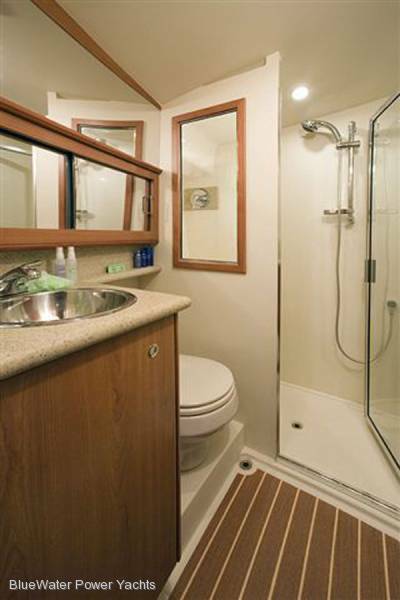 The guest cabin has a double berth and the huge master stateroom features an innerspring double berth with storage under. 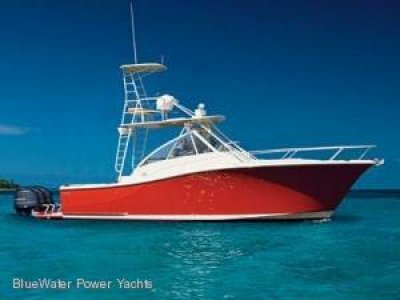 Standard power is from 2x Yanmar 380hp diesels, with options up to 480hp for those in a hurry. The Kohler 9Kw Generator comes standard with a Sound-shield. 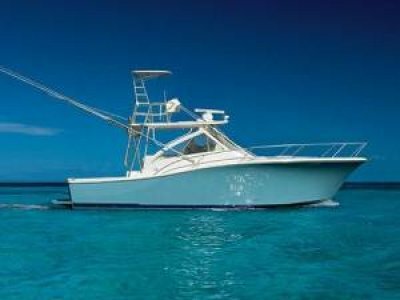 Luhrs engineering is second to none. There are 3 big bilge pumps, fire extinguishing systems, fuel/water separators, a galvanic isolator system, battery charger, bronze through hull fittings, plus manganese bronze struts and rudders. All standard. 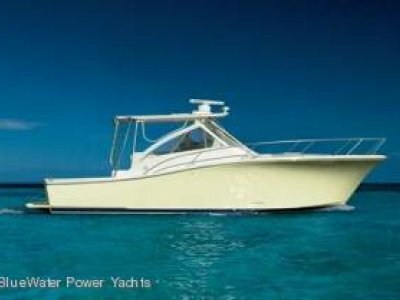 Please call Tony at BlueWater Power Yachts on (02) 9029 6554 or 0416 282 022 for full Australian specifications, options and the latest Currency Adjustment Bonus (CAB) discount availability. Galley up design, idel for entertaining, Corian benchtops AC/DC fridge freezer, microwave, 2 burner stove, good stowage. 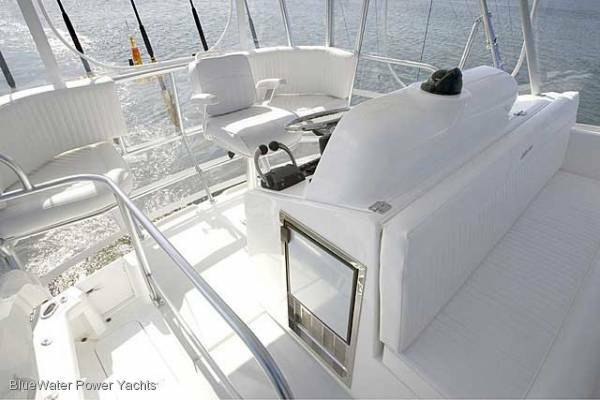 Fridge freezer in galley, cokpit ice box can be converted to fridge freezer, optional icemaker, custom portable cooler on flybridge. 2x cleats fwd, 2x amidships cleats, 2x under deck cleats aft. 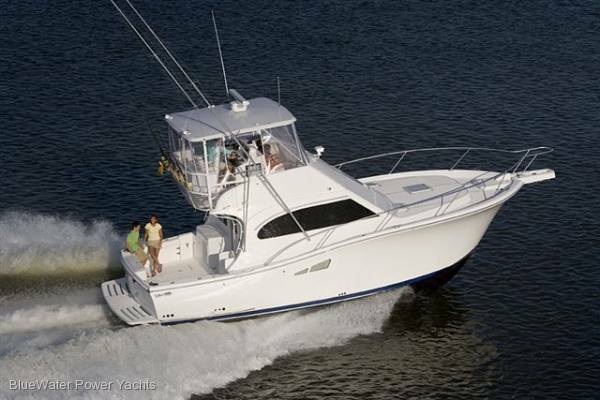 This is a beautiful and innovative boat that enjoys all the famous Luhrs handling traits. She'll still turn heads in 25 years. Australian specifications incl 240v & gas compliant.